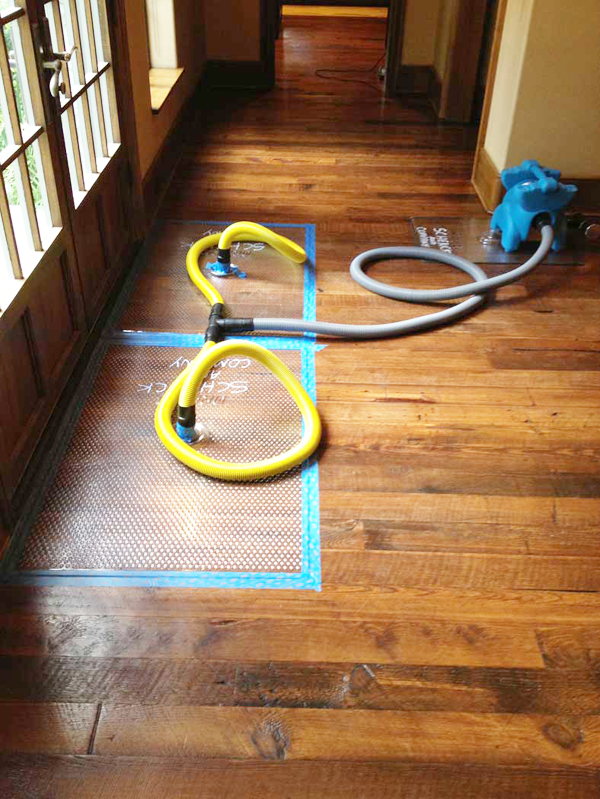 Schenck & Company offers a full line of water-damage repair and restoration techniques including the newest tool available: floor-drying mats. These ingenious mats can be used to resolve water damage issues quicker than traditional techniques, creating better value for our clients. The mats are most effective on cupped floors. In the past, we have had only three options when it comes to wood flooring water damage repair. One, to place a dehumidifier in the proximity of the water damage and then enclose the area in a plastic tent to dry the surface area and in turn, the damaged wood floors. Depending on the extent of the water damage, this process is generally more time-consuming and less effective. Option two is to remove and replace the water-damaged floor and subfloor. In some cases, the repaired area can be sanded and finished to match the existing flooring while in other cases the entire area has to be refinished. While this option is faster than using a dehumidifier, it is vastly more expensive. Option three is to allow the wood flooring to dry out and flatten naturally. While the least expensive of all of the options, it is a slow process – sometimes taking up to 12 months – and is not always successful. 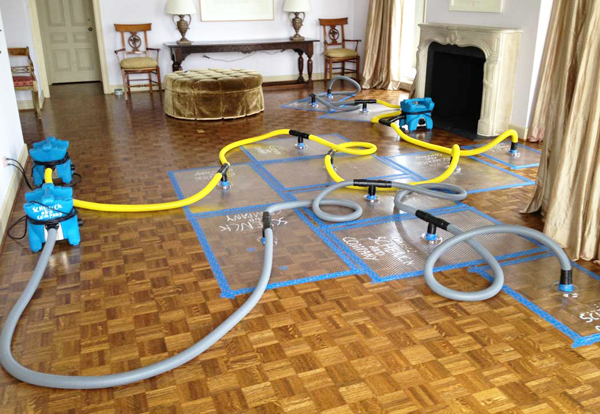 With the introduction of floor-drying mats, Schenck & Company now has a fourth, often preferable method of restoring wood floors damaged by water. The mats work by drawing moisture from deep inside the wood. They come in a variety of sizes, providing flexibility and allowing multiple areas to be dried simultaneously. Floor-drying mats enable us to restore water-damaged wood floors quicker, with less inconvenience, and more cost-effectively than traditional methods. In our experience, most floors don’t even need to be refinished after the mats have done their work. Which means we will have your fine wood floors looking their best in no time. Click here to see a video that shows the process. To start the conversation about the right solution for your particular water damage, please e-mail or call Chris Schenck at 713-266-7608.